← Been quiet for a while……. I read an interesting article in the newspaper earlier this week about broccoli and the healthiest way to eat it. As I had a large head of broccoli in my fridge I decided to experiment with it as I was cooking Sticky Salmon for our meal in the evening and instead of making Coconut Rice as was usual, I used the broccoli, a small wedge of red cabbage which happened to be left-over, some onions, garlic and a handful of flaked almonds. The result was absolutely delicious and so tasty. The rice was full of flavours and perfectly complimented the sticky, spicy salmon. 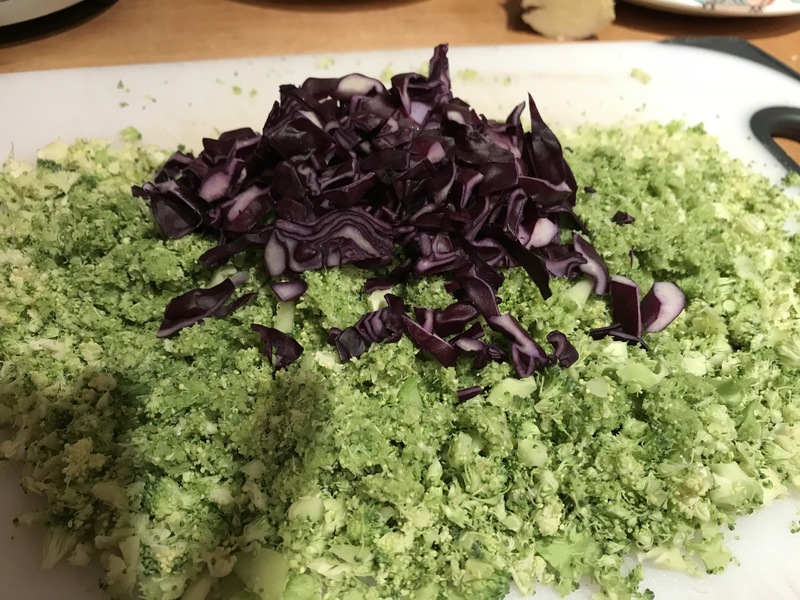 The cabbage was still a little crispy and there were a few slightly crunchy pieces of broccoli which I hadn’t chopped as small, but the taste of broccoli shone through and really lifted the rice. This dish will most definitely be made again, and quite soon. Chopping broccoli into 2mm pieces and letting them ‘sit’ for 90 minutes before gently stir-frying increases their sulforaphane levels by 2.8 times, research suggests. Previous studies show the compound sulforaphane helps to maintain people’s blood sugar levels and may even have anti-cancer properties. 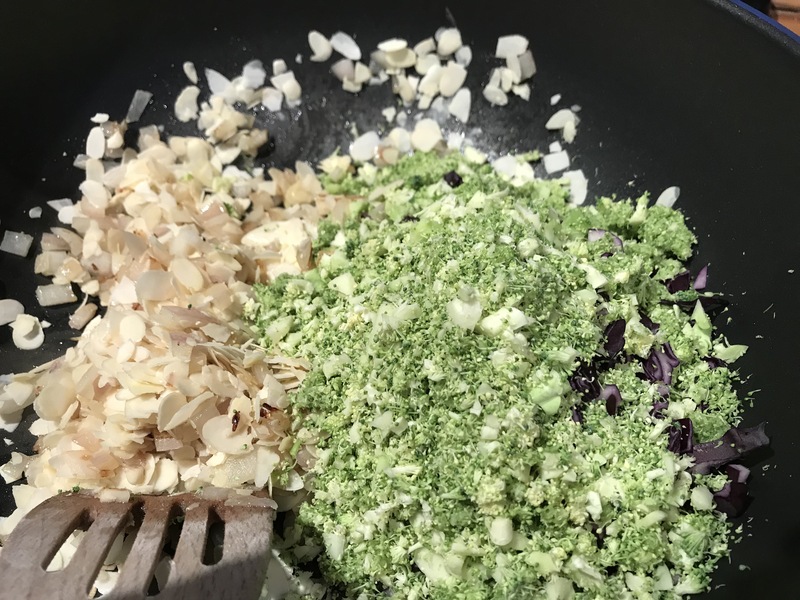 Although unclear exactly why this occurs, researchers from Zhejiang University in China believe waiting before cooking chopped broccoli may allow sulforaphane to ‘develop’. They add 30 minutes of sitting time may be sufficient. It is important to chop broccoli as sulforaphane can only be absorbed if the vegetable is ‘damaged’. Leave the finely chopped Broccoli to sit for about 90 minutes. Heat a little oil in a large wok and add the onions and garlic. Stir fry over a high heat tossing them continuously until translucent and starting to brown. 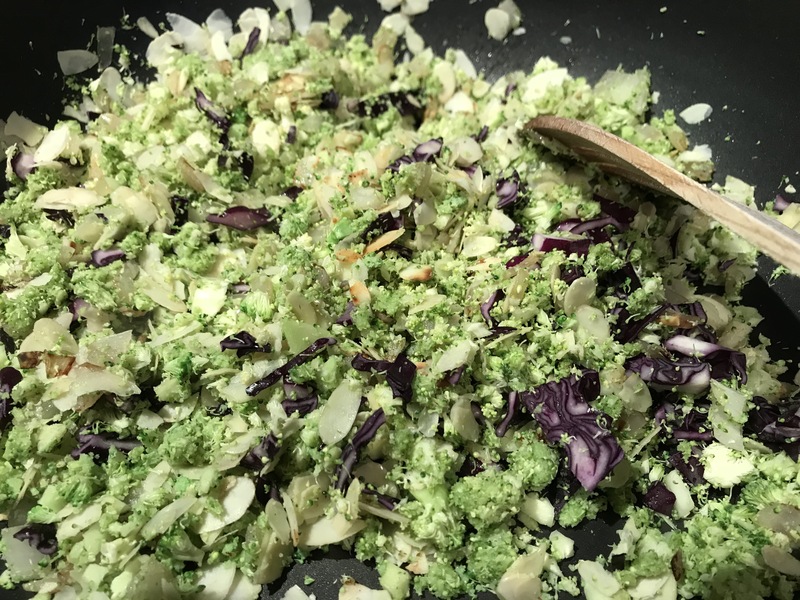 Add a handful of flaked almonds together with the broccoli and red cabbage. Stir fry quickly, tossing to make sure the almonds don’t burn. Cook for about 1 minute. Add the cooked rice and mix well, tossing until the rice is heated through. Serve with Sticky Salmon and a little of the left-over marinade which can be heated in a saucepan, simmered until thick. 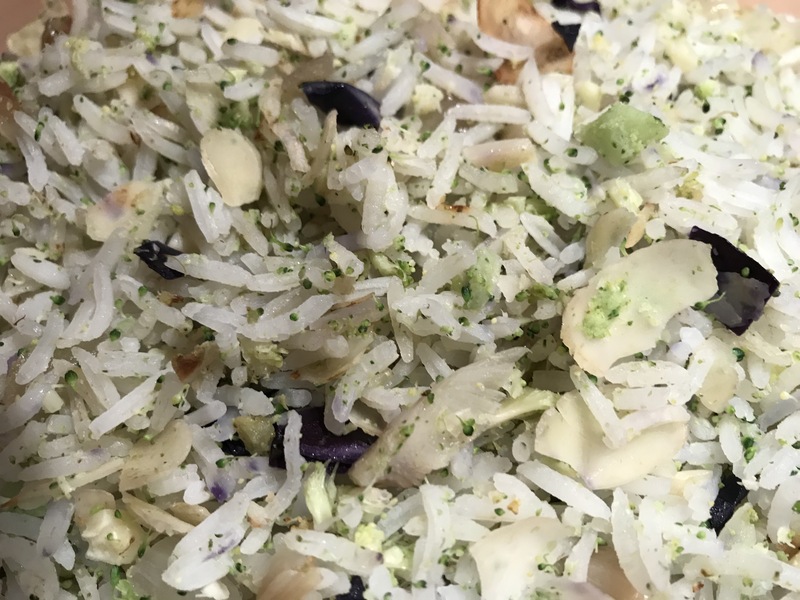 This entry was posted in Dinner, Supper, Vegetables, Vegetarian and tagged Almond, Basmati Rice, Broccoli, Dinner, Garlic, Gluten Free, Healthy Eating, Onions, Rice, Supper, Vegetables, Vegetarian, Wheat-Free. Bookmark the permalink.